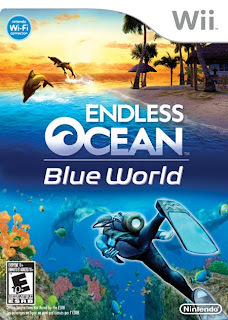 Actually, according to Amazon.com and other in-the-know sources, the follow-up to one of my favorite Wii games of 2008 has a new name--Endless Ocean: Blue World. I'm not so keen on the subtitle, to tell you the truth, but it doesn't really matter, does it? What matters is how the game looks, sounds and, especially, plays. If you're an Endless Ocean virgin, I heartily suggest you get with the program and pick up a copy of the original title tout de suite, as the French say. Considering copies seem to be scarce--and expensive, with new copies going for $89.95 and up and used copies going for $49.96 and up at Amazon.com--I'll let it slide if you decide to dive right into the sequel. Still need to be convinced? Check out this video tour of the Japanese version of the game, courtesy of Josh Thomas over at WiiFolder.com. I'm absolutely terrified of water levels in 3D video games...but I would love to play this. I'd be squeamish and uneasy the whole time, but it looks gorgeous. The original Endless Ocean was all about blissful relaxation, Justin--i.e., you observe fish and other ocean life, as opposed to hunting/fighting them--so I think you should be OK playing the sequel. Unless you're freaked out by games/levels that take place in water in general?